The state of New York came up with a productive idea - use part of lottery proceeds to support retraining of "retired" race horses, rather than let so many go to slaughter. Click on the ESPN link, above, to learn more. Part 1: Will it ruin Christmas and a chance at love? Bodie and Rosalyn walked hand in hand to the front pasture. She had not seen Excalibur since the night of her near death, four days ago. Rosalyn was sure the doctor Bodie insisted on calling had been bribed to prescribe bed rest, just in case she had a heart attack or something. But now she was free, and believe it or not, on a date. Before they left, Rosalyn insisted on checking Excalibur first. She picked her way across the lane in black patent high heels, topped by a fitted black Givenchy skirt, white silk blouse, cashmere coat gold chain necklace, and gold button earrings. The fashion statement was a gift from Bodie. She munched the last of the fortune cookies from that FAT-company-idiot. The last cookie had predicted “a heartbreaking life unless you call Fiduciary Answers Today”. If her penny proved worthless, Rosalyn supposed she would have to get used to these gifts of Bodie’s. He couldn’t help himself. Fortunately, the more time she spent with this man, the better he got. Excalibur waited at the end of the pasture, still as a statue. Rosalyn stepped through the gate, and whistled. She held a new treat in her hand, something from her childhood. Excalibur's head shot up at her call. The golden gelding nickered, and ran toward the woman. She held out her hand with the Chick-O-Stick. The horse slid to a stop in front of Rosalyn, and extended its muzzle. Whiskers twitched. Nostrils flared. Excalibur lipped the candy, took it in his mouth, and began chewing. A sigh escaped the horse. He lowered his head and let Rosalyn run her hands over sculpted golden ears. 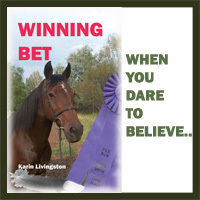 The horse rubbed its mouth along Rosalyn's sleeve, leaving a wet, green swath of saliva. Bodie snickered. "Give a horse 10 minutes with a white shirt, and you’ll find boogers and slime that you never knew existed anywhere on earth." Excalibur lowered his head for more scratching. “Or maybe he just likes Chick-O-Sticks,” said Bodie. His cell phone interrupted them. He listened, nodding. “I see. Thank you.” Bodie disconnected. He looked at Rosalyn. "Dry those tears, Roz. Your penny passed. You've got a deal. The $200,000 will be in your account tomorrow. It's amazing what you find in pond slime these days." Rosalyn and Bodie sat at what would become their favorite table at the little Italian place, which as it turned out, Bodie also owned. They shared white chocolate cheesecake topped in raspberries and hot, dark chocolate sauce. The two had stopped at the local boutique to replace the horse-slimed blouse with an ivory version. In front of the boutique, the man in dreadlocks walked past them, brushing slightly against Rosalyn. “Winds of fortune, winds of fortune,” he muttered. He wore clean clothes, nodded, and flashed a big, green-eyed grin. Bodie turned to look. “I don’t see anybody.” The hobo had disappeared. In the restaurant, candles sent golden shafts of light dancing around the room. The violinist softly drew out the melody to “White Christmas.” A very large diamond ring glittered on Rosalyn’s left hand, not the tainted, cast-off circle of metal belonging to Money Mona, Bodie’s ex-wife, but an embedded diamond designed for a horsewoman. Bodie had presented it to her two days ago while she was under house arrest. Now, clad in a black tuxedo sculpted to his lean frame, Bodie gave Rosalyn a fresh understanding of how Scarlett O’Hara must have felt when Rhett Butler walked into the room. Bodie took Rosalyn’s chocolate-covered finger in his mouth. He delicately, meticulously, licked off the sauce. Rosalyn shivered. “Oh yeah, that’s what I’m getting into,” said Bodie, “finger-lickin’ good for the rest of our lives." Rosalyn reached into her handbag for a tissue. She pulled out something crackly and hard. “Where did that come from?” She held it out for Bodie to see. Sealed in shiny wrap, a Woo’s Fine Fortune Cookie lay on Rosalyn Mallory’s open palm. Bodie lowered his mouth to the limp form of Rosalyn, pinched her nose shut, and began mouth-to-mouth breathing. One of her gloves had come off and Buck licked Rosalyn’s hand. Seconds passed. Rosalyn twitched, and Bodie rolled her over just in time to miss the coughed-up stream of water. Rosalyn coughed again, rolled over on to an elbow, and groaned. “I’m sick … beat up … why do I feel kissed to death?” She rolled onto her back and stared at Bodie. Sitting up on her couch, wrapped in blankets, Rosalyn watched Bodie stoke an already-blazing fire. Buck lay on the floor, his head on her feet. The television droned in the background, one of those soothing public-broadcast features. Rosalyn’s naked body under the blankets bothered her the most, but she supposed stripping off a hypothermic person’s wet clothes was normal in a situation like this. Rosalyn pulled the blanket tighter around her. She unclenched her dirt-encrusted hand, and let a clump of drying mud drop on the lamp table next to her. The dirt broke. A penny rolled out. “Trust me to get bad luck from good luck,” said Rosalyn. A parcel lay on the table, addressed to her. “What’s this?” she asked. Rosalyn broke a cookie, and unrolled the fortune. It read, "You will be unlucky in love, and too dense to know it when you see it." "Right. 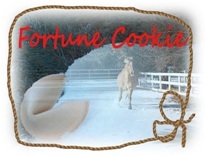 The only fortune I make is my own," said Rosalyn. “Who writes these fortunes, anyway?” She wadded up the black prediction and threw the paper ball over Bodie’s shoulder into the fire. "You know, I got one once that said I would hit upon a thing of great value." Bodie eased away from the fire, sat down next to her, and wrapped muscular arms around Rosalyn. She squirmed. However, her nakedness and the likelihood of blankets falling off, prevented further protest. Before Rosalyn could say anything, Bodie kissed her hard. She couldn’t help it. Fire poured through her veins. She kissed him back. Bodie stopped himself. This was, after all a nearly-drowned woman. He ran the blanket edge against Rosalyn’s neck through his thumb and forefinger. "OK, if you don't want my money fine, but at least let me help you with yours … What do you think I do for a living?" “Let’s just say Warren Buffet gets help,” he said. “Oh.” Rosalyn looked away, out the window. It killed her to accept help. A breeze pushed its way through silent snowfall, and what had moments ago been a pleasant holiday greeting card turned into a winter storm. The television droned the end of a feature, something on coin collecting. The final sound bite caught Rosalyn’s attention: "Well folks, that’s it. Only five of the pennies known to exist, and worth $200,000 apiece, imagine that." Jazz music played while the credits rolled, backed by an image of the rare coin. Rosalyn picked up her penny and scraped it. Her gut clenched. “Tell me I’m not crazy. It looks just like the one that was on TV.” Hands trembling, Rosalyn used her remote control to freeze the screen and zoom in on the photo of the prize penny. Silently, eerily, white flakes of snow floated down through the night, and settled one after the other on the ground, on the pond. Rosalyn began to cough as water lapped at her lips. She closed her eyes, and images of Bodie the day he effortlessly lifted the Gator one-handed, muscles rippling, his lips hovering, oh so close to hers, floated before her. The cold closing around her became soothing numbness. Rosalyn grappled behind her, trying to stop her slide under the water. Her hands hit mud, roots and something disc-shaped, smooth. She grabbed the handful, and dug deep. The world moved slowly now, nothing really mattered in this numbness, except that she felt like she had forgotten to do the most important thing in her life, but couldn’t think what it was. Something her grandmother once said came to mind: "If you have to die, you should be with the one you love." “Sorry, Grams, blew that one,” she mumbled. Rosalyn did not hear the crashing sounds of Bodie bolting down the embankment through snow and tree branches, or Buck’s frenzied barking. Bodie lashed a rope to a tree, and threw the loop over his shoulder and torso. He edged farther down the bank. "Hang on, I've got you. Just hang on!" His fingers plunged through the water, and curled around the collar of Rosalyn's coat, just as the top of her head slipped under the ice. Bodie hauled on Rosalyn’s limp form. He slipped on the wet bank, and slid toward the icy water. His boot heel caught a tree root. Bodie pulled against the rope, and it held. He half-threw Rosalyn past his shoulders to drier ground. She hit the ground, a heap of arms and legs. Bodie knelt, and flipped Rosalyn over on her back. He lowered his head and listened for her breath. Buck nudged his owner’s face with his wet nose. Nothing. Bodie felt her neck for a pulse. So faint. Forbes: How many congressmen does it take to screw a horse? I am not feeling warm and fuzzy toward my government leaders today. The answer? Three. (And the holidays, when everyone is too busy to stay on top of the news.) Click the link for the full story. "Consider the more than 70% of Americans opposed to horse slaughter who awoke on November 29, 2011, to learn that they were now on the hook for funding USDA inspections of horsemeat from the nation’s Quarter Horses (70% of those slaughtered in 2010), Thoroughbreds (16%—many, right off the track) and other hard-working, revenue-producing and well-loved breeds. Let’s also not forget the more than 5,000 Americans who recently signed a “We The People” petition calling on the President to sign the American Horse Slaughter Prevention Act of 2011. Also worthy of sympathy are the four sponsors and 175 co-sponsors of this bipartisan legislation." Reforms to U.S. child labor laws aim to keep young workers safe, but the American Horse Council (AHC) believes that they will be detrimental to the horse industry. "Thank you for contacting me about the U.S. Department of Labor's (DOL) proposed rule to update child farm labor laws. I appreciate hearing from you about this issue. As you know, on September 2, 2011, the DOL issued a proposal to update child labor regulations with the goal of strengthening the safety requirements for young workers employed in the agriculture sector. According to the DOL, the proposed rule aims to update regulations based on recommendations from the National Institute for Occupational Safety and Health, and more closely align the rules regulating agricultural employment to other sectors. Any such changes must include common-sense considerations, which is why I was glad to see DOL state that the proposed regulations do not apply to children working on farms owned by their parents. I share the concern of many Coloradans who are worried that any proposed rule must not unnecessarily limit the ability of young people to participate in agriculture, which in turn nurtures the next generation of farmers and ranchers. Taking into account the importance of encouraging young Americans to work in agriculture, I believe a balance can be struck between ensuring the safety of our children, while also providing opportunities in agricultural careers. The deadline for submitting comments to the DOL regarding this proposed rule was December 1, 2011. Even though the comment period has officially closed, I encourage you to continue to share your thoughts about this issue, and I will keep your concerns in mind as I continue to ensure federal laws and regulations work for all Coloradans. I will continue to listen closely to what you and other Coloradans have to say about matters before Congress, the concerns of our communities, and the issues facing Colorado and the nation. My job is not about merely supporting or opposing legislation; it is also about bridging the divide that has paralyzed our nation's politics. For more information about my positions and to learn how my office can assist you, please visit my website at www.markudall.senate.gov. Read also - Forbes: How many congressmen does it take to screw a horse? Ponds could be deadly, especially when you were drowning. Buck barked again and again, and edged as close as he could get without falling in. The cold water sank through Rosalyn’s heavy coat, past her sweatshirt and T-shirt, into her skin. Icy numbness froze her arms. Without the strength to pull out of the frigid water, Rosalyn began to sink. The pond water rose higher and higher up her neck. Nothing appeared wrong, with her or the truck, for that matter. Then he saw it. One of the clamps on the battery had come off. Crashing into stone signs could have that effect on batteries, he supposed. Bodie slammed the clamp back in place. Loose, but he would have to tighten it later. Rosalyn chanted to herself through chattering teeth. ""Got to get out, got to get out. Got to, got to, got to!" She heard an engine and saw movement on the driveway. Bodie’s truck, thank God. Bodie opened the door. The flurry of activity at the pond caught his eye. Then he heard Buck’s mad barking. He watched the horse. Excalibur trotted back and forth. The horse tossed his head, stopped, stamped his front feet, and resumed the frenzied trotting along the bank. Bodie followed the hoofprints in the snow. His breath caught in his throat. The prints stopped at the crazed dog. The dog stared at the still form in the frigid water. RENO, Nev. (AP) — A coalition of conservationists and wild-horse activists is suing the government to block its implementation of a precedent-setting plan to castrate hundreds of wild stallions in eastern Nevada. What do you think? Is there an alternative to gelding our nation's wild horse stallions? Is grazing so limited that wild horses will die of starvation? Who is telling the truth here? Programs like the Extreme Mustang Makeover Competition give me hope. Cash the Mustang, a local horse, traded the wild life for the good life, thanks to the Extreme Mustang Makeover program, and a kind human willing to take the time with him. Battling beaver clogs was not for the meek. Rosalyn paused, breathing heavily. "Putrid rodents," she muttered. She turned to Excalibur, who stood nearby, watching. “You know, rodents and men, they are a lot alike: Into everything, and always causing problems. Why can’t they just leave me alone? Or better yet, quit throwing their weight around?” Rosalyn remembered the kiss on the church steps, and bit her lip so hard it made her eyes water. Next to her, Buck began digging, too. Headed her way with the solution to all of Rosalyn’s problems in tow behind his truck, Bodie whacked the steering wheel again. His truck lurched to the right. Bodie swerved back to the middle of the lane. He caught a glance of himself in his rear view mirror. The face staring back was masked by days of frustration, probably frustration over this idiot woman who wouldn’t take his help. Was it just a lie? Bodie put their imaginary future on the imaginary line, and repeated what he said to Rosalyn earlier: "Choose now, Rosalyn. Quit hiding." The engine died. "Perfect," he said, “just perfect. Excalibur stamped a foot and snorted. His nostrils flared. He pawed, but the woman scrambling at the beaver dam ignored him. He wanted her to stop. Looking over his shoulder inside of the Woo’s Fine Fortune Cookies factory where he had just been hired, the man with dreadlocks saw that he was not being watched. He logged in to his workstation and opened the fortune file. A few sentences later, his mission was accomplished. The man threw his locks back and laughed. He stood up, and walked out of the factory into the parking lot. The modern art anchoring the lot’s decor was a metal tree with fortune cookies for leaves. It was also an experiment in the art of sound. A breeze hit the cookies, and they began to moan. The hobo looked up. A shooting star cascaded across the horizon. Tears welled up in Rosalyn's eyes. She wiped them with the rough sleeve of her work coat, and chewed her lower lip. As a child, she had growled when angry, until her mother told her to quit acting like an animal. It was either growl or cry. Rosalyn growled. The horse paced, watching her. Buck looked up from his own digging, and whined. Then it hit Rosalyn. Not the horse or the dog, an idea. She reached into her pocket and held out a treat. “Come here, Excalibur. I have a job for you.” The horse stretched out his nose, and refused the treat, but let her slip on the halter. “Now that’s more like it. Trust the human. Good horse.” Rosalyn held his lead line in one hand and bent over to pick up the rope. The palomino snorted softly. “We’re just going to use a little horse power here,” she said, and wrapped the rope around the base of Excalibur’s neck. “See I just need you to give a little tug here, get the stupid dam loosened. Just one stick loosened, just a little leg up, so to speak.” She smoothly tied a bowline, the one knot that wouldn’t slip. “OK, Excalibur, I need you to walk. All you have to do is walk. Can you do that?” The horse flicked an ear at her. “Walk, Excalibur, walk.” The horse walked as if on explosive egg shells, but he walked, nonetheless. The powerful gelding appeared to agree, just this once, to do her the favor of a truce. The rope tightened. The clog unclogged with a huge whoosh of debris. The blob of a load shifted and slipped out of the rope. Frightened, Excalibur lunged away, and his momentum upended Rosalyn, pulling her feet out from under her. Rosalyn hit her head on a rock, back-sledded down the iced-over bank, and plunged into icy water up to her neck. Shooting stars danced in front of her eyes. Stepping away from the pond, Rosalyn peered down the road. I’m just checking the traffic. I have no interest in whether his red truck happens to show up. No interest at all. And, it’s not here, so there. Rosalyn set down the rope and shovel. She kept the pry rod in her hand, and squared her shoulders. Pond water from the beaver clog oozed higher. Soon her land bridge would disappear. Nearby, where she had turned him loose, Excalibur nosed through the snow looking for tender bits of grass. He watched Rosalyn out of the corner of his eye. A muscle in her jaw clenched. She watched the horse watch her. I should be riding you, not fighting beavers. Talk about rider’s block. Then again, you’d probably just dump me, so what’s the point? Rosalyn swore. Excalibur winked. Or at least she thought he did. Rosalyn jammed the pry rod up the clog and wiggled it. A twig, some ice chips, and half a cup of sandy dirt flowed away. She tried again, this time on the other side. More sand, ice, a handful of what looked like shredded tree bark. Beaver food, of course. The beavers, her money situation, Bodie’s arrival on the church steps, his kiss, they haunted her. The sky darkened, and sleet spat down. Half-frozen water drops struck dead leaves, and rustled. At the edge of the pond, Buck whined. Everything was against her. "Stupid men! Stupid money! Stupid clog!" Rosalyn whacked the root- and-dirt-infested mass with her shovel. "You pig!" She hit the clog again, and leaned against the pry rod, mouth against her glove. Its soft leather reminded her of Bodie’s lips. That darn kiss would not go away. She rubbed her mouth. "Stupid, stupid, stupid!" She hit the plug again, and then stopped. There was another sound, a shout. "This is it! The time is now!" The derelict man walked down the road and gestured. He stopped at the bus stop sign just outside her driveway. Again the man cried, "This is it! The time is now!" The No. 9 bus pulled over. Clutching a page of the classifieds where an item had been circled in red, the man, dreadlocks flapping against his shoulders, boarded No. 9. The bus pulled away, headed for the light industrial section of town. At least he’s going somewhere, unlike me. Rosalyn pummeled the clog. Nothing. The rustling leaves faded into silence, as sleet turned to snow. Rosalyn pulled a knit cap out of her pocket, and shoved it over her dark mane of hair. She muttered, “So much for a clear and mild week." Bodie stepped on the accelerator, and the truck sped forward. The rattling of the equipment on the trailer behind reminded him to slow down. He sighed and slowed. Why all the hiding who he was? Why couldn’t she just take the help and be done with it? He smacked the steering wheel. "What’s the deal, lady? Over and over again, I try to tell you, I won't hurt you, for real." Rosalyn pounded the pry rod through the center of the icy clog. A double handful of sticks and mud fell away. Water flowed through the break. She inhaled, stepped back, and stared at the darkened sky.